if you haven’t heard of the new pattern company Thread Theory, you’re in for a treat! or at least the men in your life are. as i sew more and more of my family’s wardrobe, that means my husband, nathan, occasionally gets a new piece to add to his closet. after sewing a few shirts earlier this year, it was time to start making some pants. the state of available menswear patterns is pretty uninspiring to say the least. clearly there is a gap in the market waiting to be filled, and Thread Theory patterns is posed to be one of the first in line to fill that gap. they have an up-to-date take on classic looks and i am very excited to see where they are headed. pardon the rumpled appearance, these have already been worn several times and gone through the wash. what can i say… he likes his new shorts! i’ve been following Thread Theory for a short while, and when i saw their newest pattern offering, the jedediah pants, the release couldn’t come soon enough! my husband is on the smaller end of menswear sizes and pants, in particular, are almost always too big and way too long. i immediately begged offered to be on the list of pattern testers, and when the call went out i jumped at the chance. 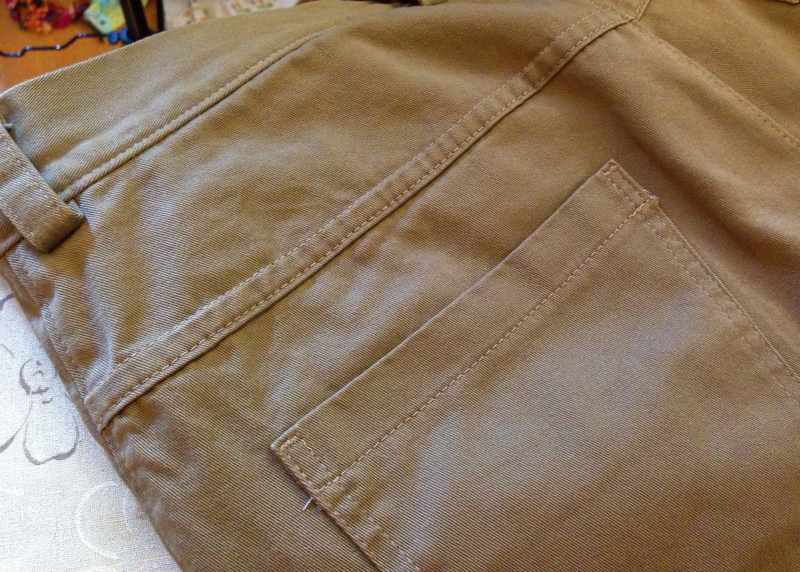 since i’ve done a lot of pants and shorts lately, i can knock them out relatively quickly. of course i’m accustomed to not following pattern directions, so forcing myself to actually read every step was a huge challenge for me. however, for the sake of pattern testing, i figured i should! 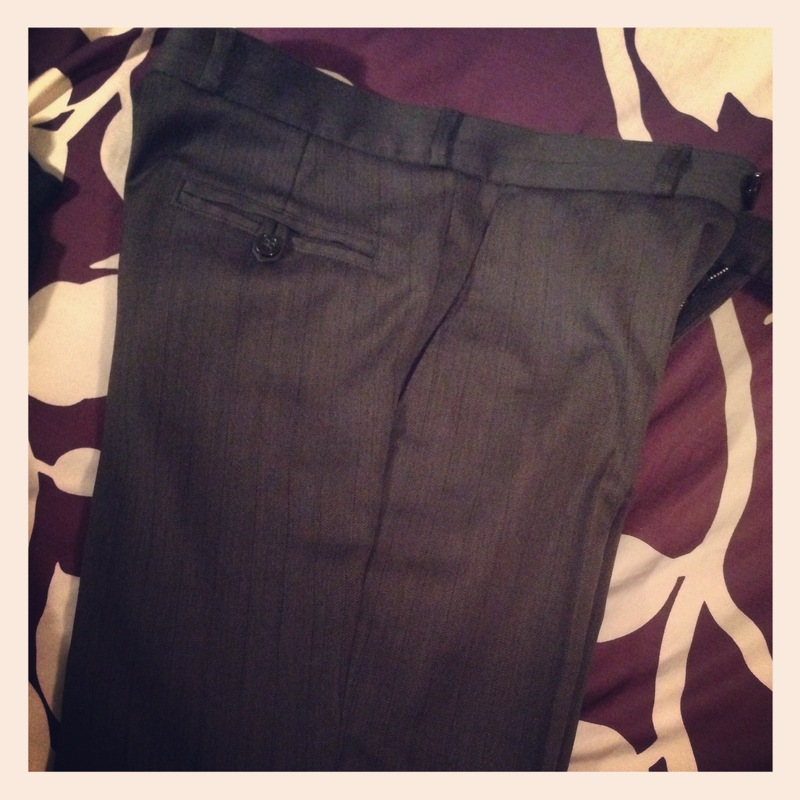 the jedediah pants are a casual pant with a dressy edge. they have a flat front, slash pockets, back patch pockets, and back yoke. the great thing about this pattern in particular is the fact that they have included instructions for things like flat-felling seams, bar tacking points that need reinforcement, and even french seaming the pocket bags (p.s. i have a tutorial on that if you need a visual). they also include the pocket facing pieces and the fly shield. it is a fold-over fly facing, but since every other detail is there, i won’t complain. 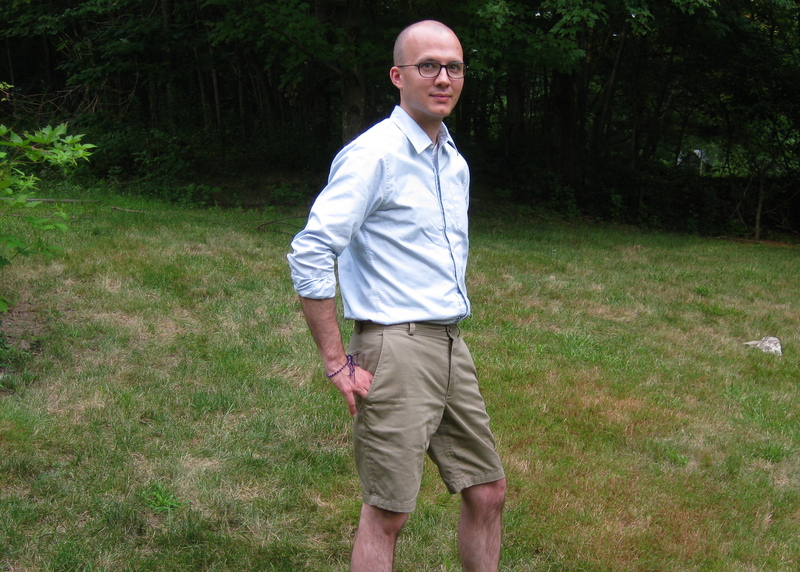 for this pair i used a medium-heavy cotton twill and went with a shorts length. i love the cuffed variation the pattern offers, but my fabric was a bit bulky so i ended up hemming them to knee length. if you’re not into the tapered leg it would be super easy to change it up, depending on what look your guy prefers. 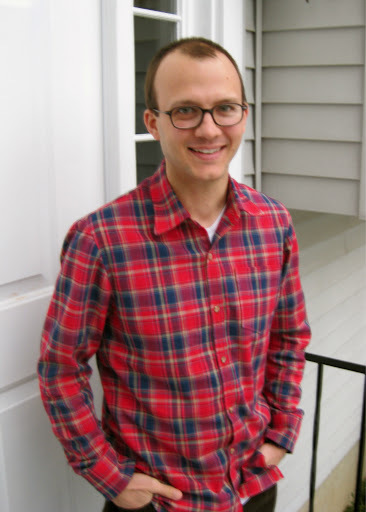 as far as the fit goes, nathan typically wears a 30 in RTW so that is what i cut. as i was sewing them up, i thought i should check for sure what his measurements actually are, and lo and behold his waist is closer to 32″. afraid they would end up too small, i sewed the side seams at 3/8″ as well as the back seam. this left him plenty of room, but now the waistband i cut was too small. i had more fabric, but instead of cutting a new waistband (heaven forbid i waste fabric! 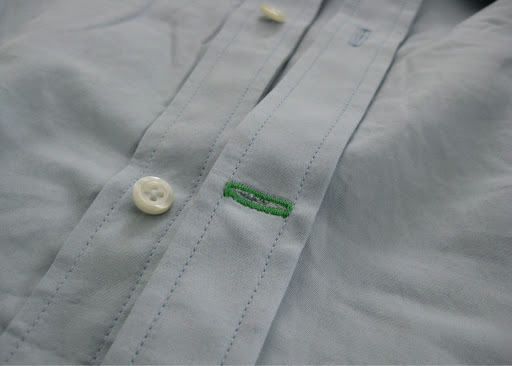 ), i simply pieced it right under the button closure where it won’t be visible. lesson: actually measure your guy’s waist. i believe these are sized a little slimmer than your typical RTW, but the pattern does include finished measurements to help get a proper fit. since this is the first pair of pants i’ve sewn for my husband, this will definitely be my go-to for a casual pant or shorts. the fit is great, and it’s nice to see him in clothes that do fit instead of drowning his frame. the only downside is that once you’ve been bitten by the custom fit bug, you just can’t go back! he’s already requested more. 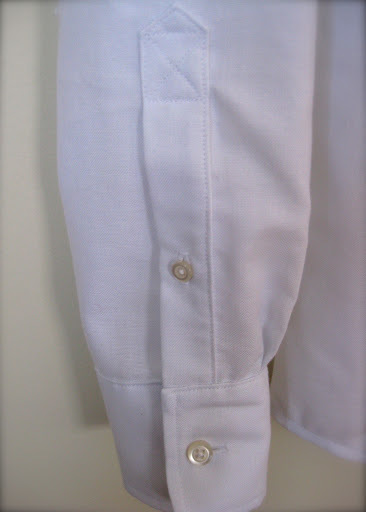 🙂 if you’ve thought of making pants for your guy, there will also be a sew-a-long over on the Thread Theory blog beginning august 15th to help you through the process. 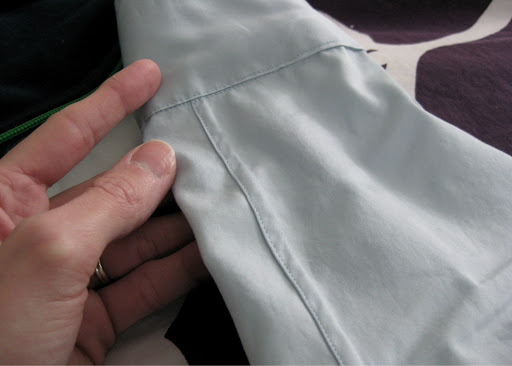 however if you’re impatient and want to get started sooner, the included directions are very thorough, even if you’ve never sewn pants before. seriously. they left nothing out! 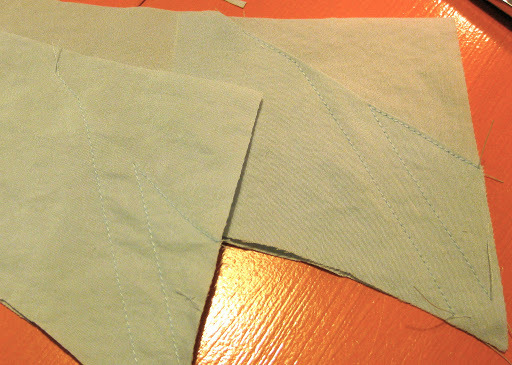 so what do you think… tempted to sew a pair for your guy? one thing my husband likes on his dress shirts are channels for collar stays. 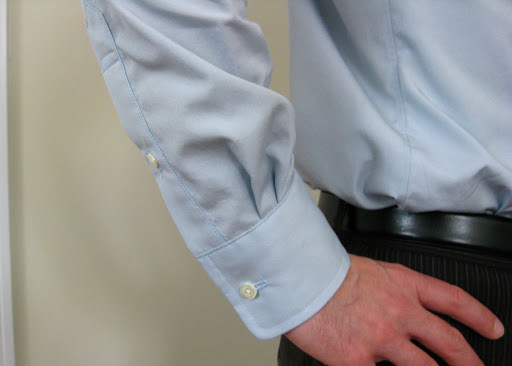 it’s pretty easy to figure out by looking at a dress shirt that already has this feature, but here you go anyways! first cut two under collar pieces. if you don’t have enough fabric to cut the second one in one piece, just cut out two halves; you really only need the outer thirds of this piece. take one of your under collar pieces and mark a line from the collar point angling up the direction you want the channel. then mark 1/4″ on each side to give you a 1/2″ wide channel. fold down the corner of the collar that attaches to the stand. as you do all this, make sure you check where the seam allowances will fall so that you keep the entire channel opening free from the collar stand once it is all sewn together. 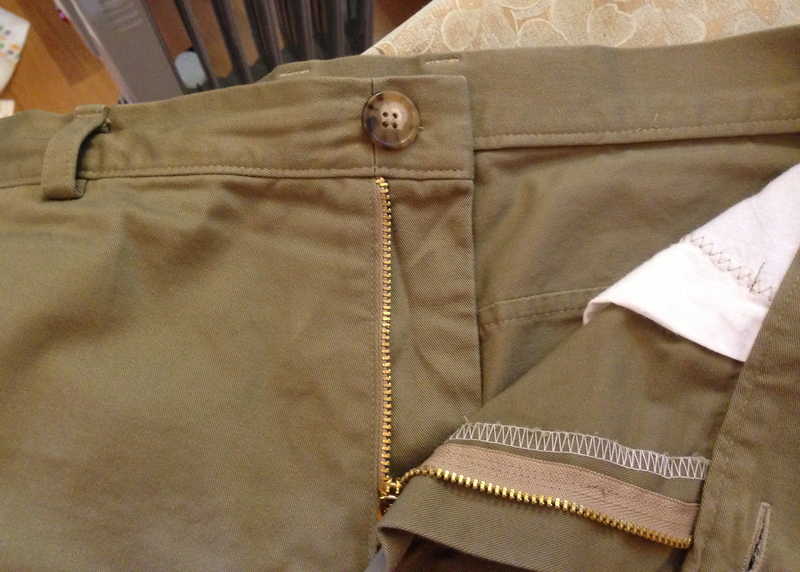 once you are confident you have this all worked out, trim away all but 1/2″ of the folded under bit. 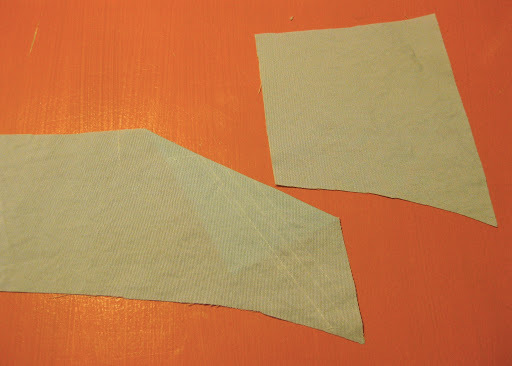 now you need to fill in the gap that you just folded over, so take the second under collar piece and position it under the first so that it fills in the gap. if you are not using an entire under collar and had to piece it, check the position against your pattern piece to make sure it all lines up correctly. pin it all in place then edge stitch turning when you get to the stay channel. do this on both sides of the channel. you can trim away what you don’t need of the back layer so it only covers the channel, or you can leave the entire piece attached. 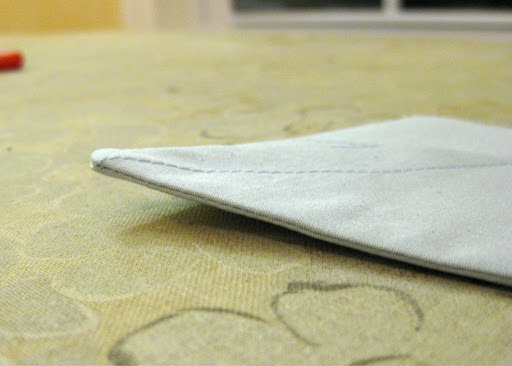 if you do this, i would suggest trimming off the seam allowance to reduce bulk. depending on what you like to use for stabilizing the collar this under piece could take the place or add to whatever stabilization method you prefer. i didn’t trim much at this point, but later i did trim some bulk out of the point. just something to watch for. after all that is done proceed as normal to construct your collar. i also wanted to show you what a difference it made in my collar construction by cutting the under collar smaller and stretching it as i sewed. the collar naturally curves and ultimately gives you a smoother line. had i trimmed as much width from the under collar as i was supposed to, the curve would be even more pronounced. during which time not only was it difficult to leave the house, we were expressly forbidden to at risk of fine and/or imprisonment. not kidding! not that i had any intention of driving around in a blizzard, but there you have it. 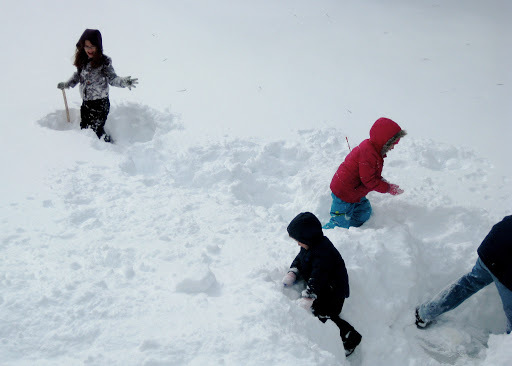 we got 2 feet of snow and literally had to dig our way out the front door. so what’s a girl to do while snow is falling at an alarming rate? why sew, of course! i already had this dress shirt cut and fused and waiting for it’s turn under my needle. after cutting the shirt i perused david coffin’s “shirtmaking” and wanted to employ some of his techniques. while i didn’t strictly adhere to his method on all points, i did pay close attention to how he does the shirt collar. while i haven’t achieved perfection here, it was interesting to see how such small changes improved my collar attempt so dramatically! to me at least. i’m not going to detail a full rundown of his methods, mostly because he does such a great job of it in his book, but also because duh! he wrote a book and it’s hardly fair for me to just put it all out there on the internet. if you’re not interested in owning a copy, most likely you can find it at a library. my library has a great inter-library loan service so i can get virtually any book i need. that’s how i tracked down this source, though i plan to buy a copy soon to have on hand. stitched in green my signature okay? to start, he gives you several different seam allowances to work with. he suggests 1/4″ for most parts of the collar (except the edge of the collar that attaches to the stand—that you leave 5/8″) which allows for more control and accuracy. i find 1/4″ difficult to stitch because it falls under my presser foot, which i obviously can’t see, so i went with a 3/8″ SA. 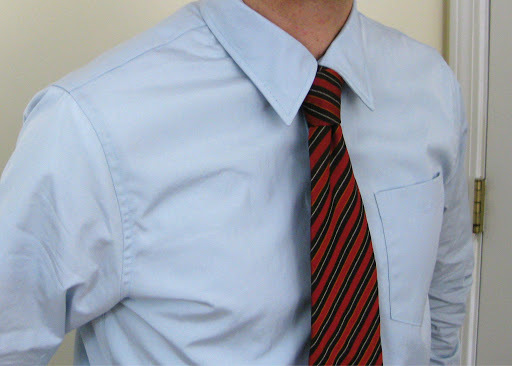 he also suggests trimming width off the under collar and inner collar stand, so the under or inner side of these pieces are 1/4″-1/2″ smaller than their counterpart. i find it interesting that he has you stretch the smaller piece as you sew to fit the larger piece. what i have seen before, say in tailoring a coat or jacket, is to cut the outer pieces larger then ease them down to the smaller size. do you see the difference? it’s subtle, but it really works well. when you let go, the collar just naturally curves itself! very cool. i was a bit nervous and didn’t trim as much as he suggested so i still have a few wrinkles. next time i’ll follow more closely for sure. 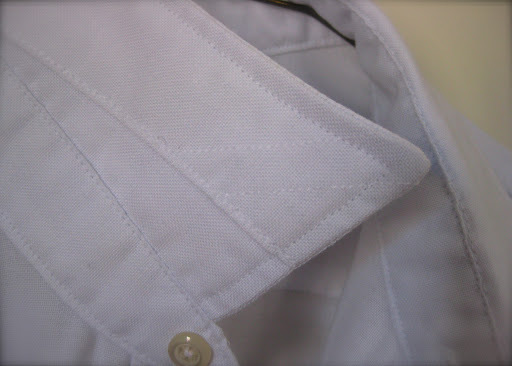 i always had issues getting the rounded edge at the front on the collar stand to look good. i could never figure out when to sew that little curved bit and thankfully, coffin address this very well. no more guessing for me! all in all, the collar on this shirt is much more crisp and formed than my previous attempts. i still need some work on my collar points. i may need to invest in one of these. i’m still not great at flat felling. i had removed most of the ease in the sleeve cap because it’s quite unnecessary here and makes felling even more difficult. i think with practice i’ll get a little quicker at it, but i spent f-o-r-e-v-e-r putting those sleeves in and felling them. the side seams, by contrast went super fast. it’s still tedious to get all the way up or down those sleeves, but using my new felling foot at least got my stitching far more even. another thing i found interesting was how coffin recommended a very short stitch length. 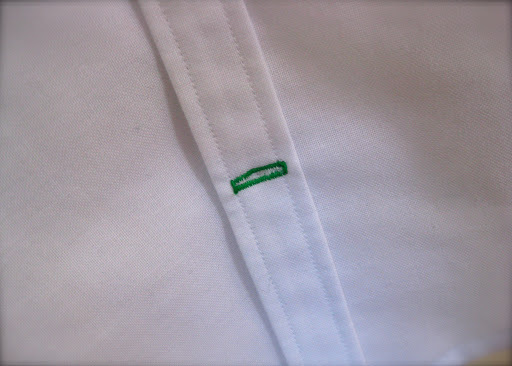 i had noticed while examining my husband’s rtw shirts that the topstitching was done with a very short stitch, so i did this on the last shirt, but he suggests that you do all your construction with a much shorter stitch. his argument is that the shorter stitch uses more thread to go up and down with each stitch which enables the fabric to retain some of it’s natural give. i noticed that i was getting slight puckering in my seams, but dialing down the tension a touch took care of that. there are still minor changes i’ll make next time around: widening the button placket (coffin recommends 1 1/4″, this one is 1″), turning the under button placket to the inside instead of the outside, widening the back pleat, etc. 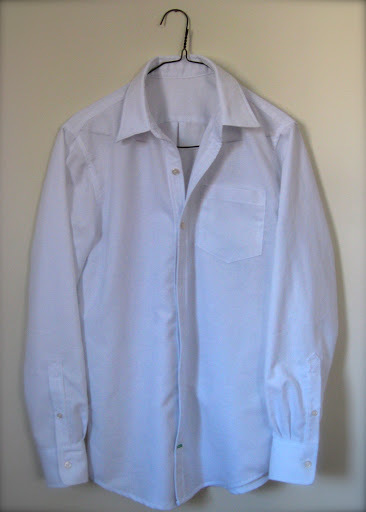 i do feel pretty good having made three dress shirts this year, and it’s only mid-february! i know more will be on my plate before long, but these are a good start. actually, i wouldn’t mind making one for myself. each time i make one i keep thinking, you know with leggings and a belt i think i could wear this… focus lisa, FOCUS! this is one of two shirts i cut out for my husband, this time dress shirts for work. there is a dive fabric shop nearby that has amazing deals and i picked up some white and light bluish grey shirting for $2.50/yd. since i’m still learning all the tricks i’m not ready to splurge on the $10-$20/yd quite yet. i made the white shirt first with a couple fit and design alterations. i widened the neck by about 5/8″. when i had him button the top button on his first shirt, it was definitely too small for tie-wearing. also, the sleeves were a touch long, so i shortened the sleeve by 1/2″. then i did the front placket different. 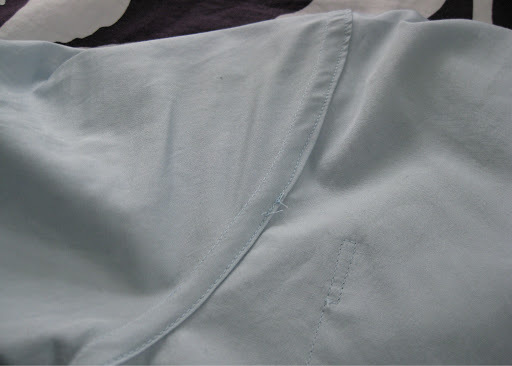 i extended the center front of the shirt front so i could attach the placket at the edge then fold it onto the front, then top stitch.it’s a small change, but it requires less blind precision and eliminates hand stitching the placket from the inside. i went ahead and flat-felled the sleeve/shoulder seam as well as up the sides and down the sleeve. surprisingly not as hard as i thought it would be! i just ordered a felling foot to make this stitching a little more precise in the future though. 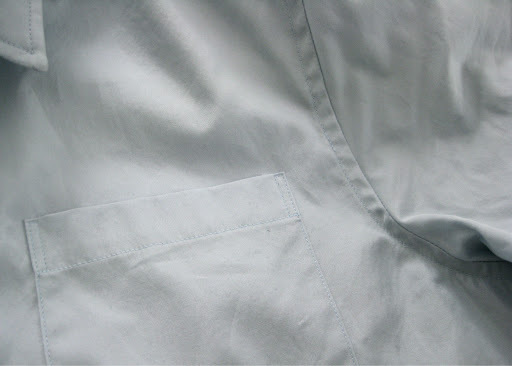 it’s damn near impossible to hide imperfect stitching on a light solid colored fabric, let me tell you. i decided to track down the ultimate resource in shirtmaking, aptly titled “shirtmaking”, by david coffin. since the husband has tasted the fruits of custom clothing there’s just no going back. i’ve glanced through the book and there is so much information to absorb. he has great techniques for all the tricky bits and i will no doubt rely on this book heavily. i had promised a sleeve placket tutorial to go with my pattern piece, but i made this one in the evening and had no adequate lighting. i’ll make sure to do the next one during daylight hours for your benefit. it did turn out rawther well, i think. overall i’m pleased with how the shirt came out. the fabric weave is looser than a lot of shirting so i had some issues and struggles all throughout. the next one has a very tightly woven fabric so i think it will come together a bit easier. even though i have it cut out, fused and ready to go, i have another project i’ve already started: thurlow pants in denim! the shop that i picked up the shirting fabric at always seems to have a pile of denim for $2.50/yd and i finally picked some up. 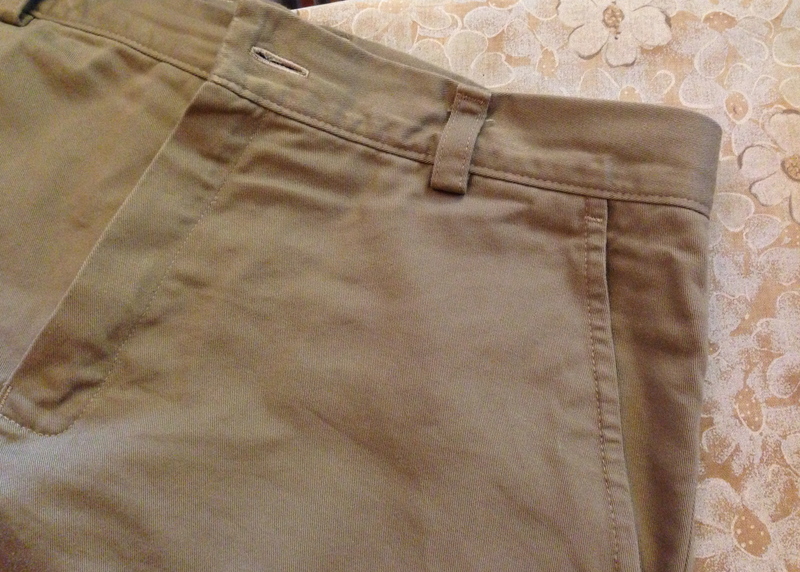 plus i have an unblogged pair of pants i made for my daughter… ack! it’s only the end of january and i’m already getting behind in posting! finally, finally! the lovely guy who supports my addiction, obsession, useful skill of sewing FINALLY has his own garment to show for it. i should have done this ages ago, but… well… i don’t really have a legit excuse. 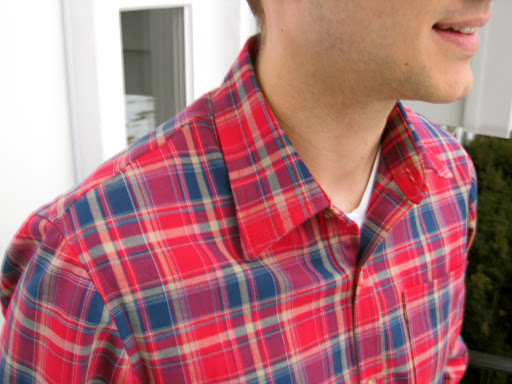 i picked up some plaid shirting from fabric.com and used mccalls 6044, which i picked up for $1 at joanns. i mentioned in my last post that i had a laundry list of gripes about this pattern, but upon further reflection i’ll just call these “changes” and QUIT COMPLAINING. overall, this is a decent pattern. the fit for my husband is an unaltered, straight out of the envelope size small, and it’s basically perfect. (to all of us who do extensive alterations on patterns to get a decent fit… I KNOW! so not fair.) and it’s not that he doesn’t fit a standard RTW size, but he’s small-framed and those sizes aren’t heavily stocked. 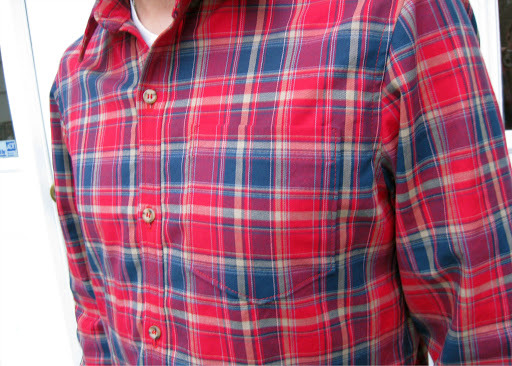 ultimately i want this pattern to serve as a business shirt that i can make over and over whenever he needs a new one. right now he needs about ten. i went to his closet, checked out all the details on his RTW, and here is is what i changed. 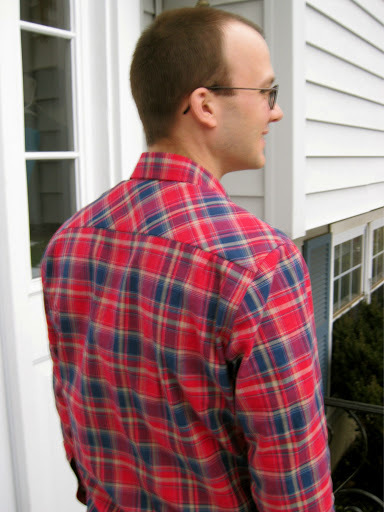 i drafted a back yoke piece that was straight across the back (instead of the western style—though i love me a good western shirt) and did the whole two piece yoke sandwich thingie (or “burrito” as described by peter at MPB). then i added 1″ in width to the back piece so i could add pleats. his casual shirts have two pleats out toward the shoulder and that’s what i did here. his dress shirts have a single larger pleat in the middle, so i can easily change where i pleat the back piece as needed. 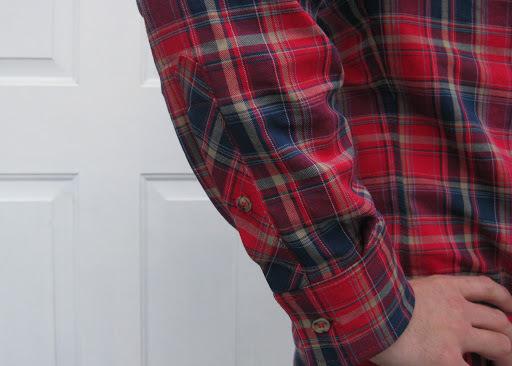 for the long sleeve version in this pattern, there are two pieces to the sleeve. 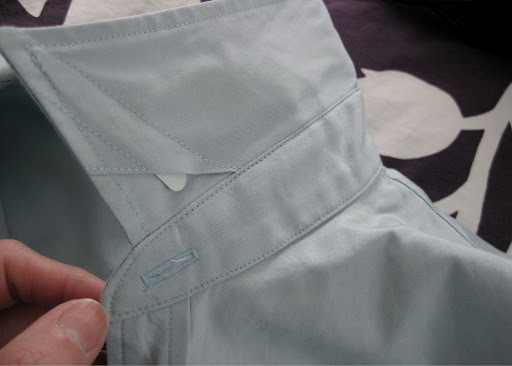 typically there is a button placket at the cuff, but to get around doing a regulation placket, you are instructed to turn the SA’s in and topstitch. eh. not gonna cut it for me. all i had to do was lay the sleeve pieces together along the seam line and cut it as one. but, then i had to figure out and draft the button placket. i had instructions on how to sew it in a book, and after a bit of puzzling i worked out the dimensions and drafted my own. if anyone is interested in having this pattern piece, i plan to create a .pdf with instructions at some point. i measured the plackets of his existing shirts so what i have is a pretty standard size, though it could be customized according to preference. i didn’t flat-fell the seams on this one, though i plan to for future makes. i did serge and topstitch for a faux flat-fell. i set the sleeves in flat, so topstitching the side seam and down the arm was something of a challenge. it was like sewing in a tunnel. not sure if i’ll be skilled enough to flat-fell it this way… if anyone has tips for me on how to do this, please speak up! i’m a complete newbie on this one. i bought a 1/4″ piecing foot for quilt making (i have grand plans to use up my leftover fabric scraps and turn them into my very first quilt), but i found it came very much in handy as a guide for topstitching, fancy that. 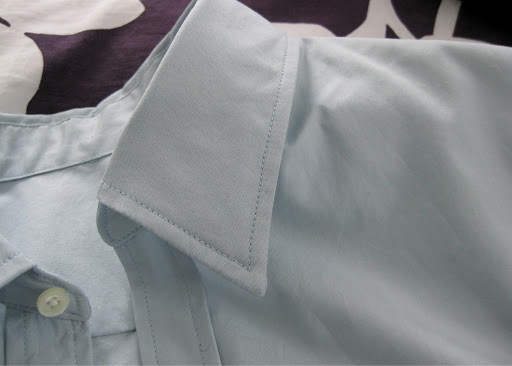 the only thing i plan to change for future shirts will be how the front button placket is done. it’s fine as writ, but it requires a bit of lining up so that the inside and outside edges line up perfectly when topstitched. there’s an easier way that minimizes both bulk and room for error. 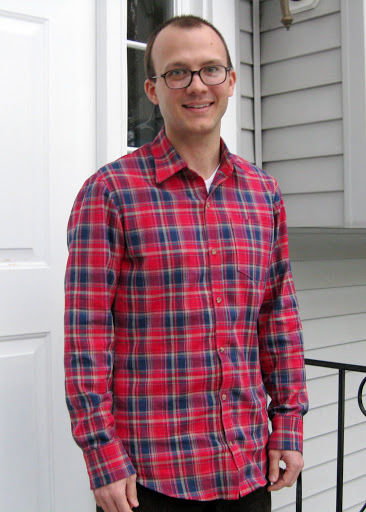 next time i make a shirt (and i’ll be fabric shopping for white shirting this week—wish me luck!) i’ll elaborate and show how it’s done. so what did i learn? the button down men’s shirt is not to be feared ladies! it took a little more of my attention since the process was not my normal autopilot dress or tee shirt, but difficult? not really. okay, the collar can go very wrong very fast, but other than that, not difficult. you will see more of these from me. and maybe even one for me if i ever get around to it.